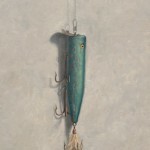 I painted this lure like I always do, from direct observation. I’ve definitely gotten into the swing of things, setting up objects to paint in my staging area and controlling the lighting. 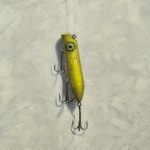 While it’s true that the hooks on the fishing lures can be difficult to paint I have gotten somewhat used to this task. As I’ve written about in the past, it all starts off with a super-accurate drafting (drawing) of the subject matter. 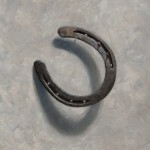 Besides, the cast shadows created by the hooks are an awesome part of the artwork! 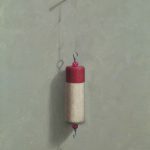 I stumbled upon this fishing lure via an old acquaintance of mine, John. John is a retired math teacher and really great photographer. A professional for sure, John actually did the photography at my wedding! To be fair it was he and his wife that shot the event. That’s my beautiful wife, Elizabeth on our wedding day! This lure was the least colorful in my possession, but it had such a unique form and had some interesting embellishments. The entire head had a flat angle to it which ended with a simple v-shaped mouth which was painted red. Alongside the head was a distinctive eye that was golden in color offset by a surrounding patch of blue. Does this stuff really fool a fish or are these anatomical details more to entice a human into purchasing the lure? 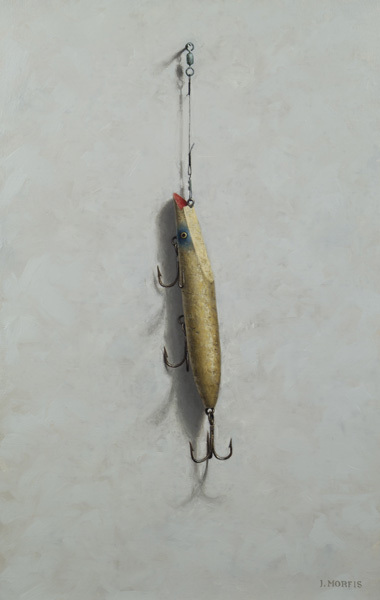 The lure was really beat up which I liked of course and rather lengthy. I added a short wire liter setup complete with clasping hardware and swivel. I’ve been using this same hardware in my lures lately. I’ve really liked how it adds to the overall composition. John used to tell me about his family adventures up in Cape cod and that’s how I came up with the title for this painting.